Multiple things ended in Detroit in 2018: The team’s years-long streak without a 100-yard rusher. Matthew Stafford’s seven-year run as a 4,000-yard passer. And in a lot of ways, the team’s streak as a prime producer of fantasy talent. Kenny Golladay produced well in his second season, topping 1,000 receiving yards, but even he fell outside the top 20 wide receivers. 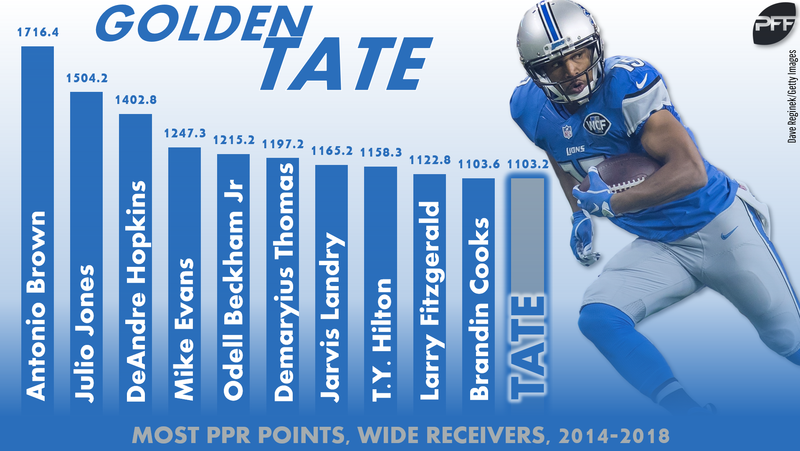 Golden Tate was shipped out of town, while Marvin Jones was disappointing even before his injury. The team got essentially no production out of the tight end position, and while Kerryon Johnson was good as the running back who ended that streak and put up more than 14 PPR points per game, he played only 10 games and didn’t have huge involvement in the passing game while he was active. The Lions have already made one significant change this offseason, bringing in historically run-minded Darrell Bevell as the new offensive coordinator to join one-year head coach Matt Patricia’s staff. Will that mean good things for Johnson? And what other moves are we hoping for from the team this year? If the Lions, as it appears, are going to feature an even more run-heavy offense in 2019 than they did in 2018, they’ll want to focus on their run-blocking as a team. The Lions ranked bottom 10 in the league with a 60.9 run-blocking PFF grade in 2018, a number that will need to improve for Johnson (and holdover Theo Riddick) to reach any kind of fantasy ceiling in 2019. Saffold is among the top run-blockers on the market this offseason and while he’ll have a big market and command plenty of money, he’s the kind of expense the Lions should consider. Tate had a dominant run in Detroit. He joined the Lions in 2014 and has the 11th-most PPR points among receivers since then, less than half a point behind Brandin Cooks in 10th. As the running mate to first Calvin Johnson, then Jones, then (nominally) Golladay, Tate did his damage in Detroit as a prime underneath weapon for Stafford. While a reunion with Tate isn’t in the cards (if there were even a chance they wouldn’t have traded him away in the first place), the Lions can settle for the off-brand version of Tate with Humphires (or Cole Beasley, if they so desire). Get an underneath weapon for Stafford to pair with Golladay’s skills and the passing offense can still produce even if the quantity of passes isn’t there. Seferian-Jenkins had a quasi-breakout as a receiver with the Jets in 2017. He signed with the Jaguars last offseason, but injury kept him from making an impact as a receiver there. He did show the best run-blocking numbers of his career, though, putting up a 73.0 run-blocking PFF grade that was sixth of 85 tight ends with at least 100 snaps. Adding a skilled blocker with receiving upside to a team that got nothing for fantasy out of the position in 2018 would be a very enticing addition.